Suncatchers' Dream - Welcome to Suncatchers' Dream! Featured Artists from Sanibel Island, All Over the Country & Abroad! Everyone knows Suncatchers' Dream is a Sanibel Island "Must-See". Now our Online Store can fill your need for a Sanibel "Fix" until you can get back in person! 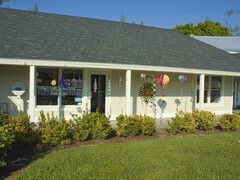 When on Sanibel stop in to say "Hi" to Dan and get tips for shelling, fishing and dining. Look forward to seeing you!